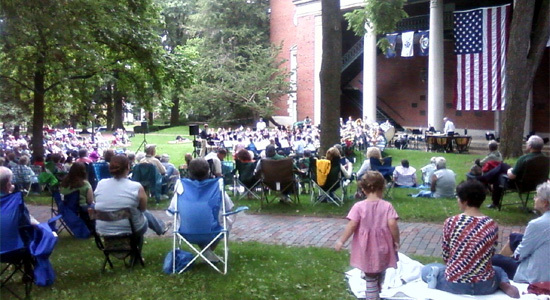 This evening Sarah, Tommy and I went to the Under the Elms concert series on Ohio University's College Green. The evening's performance featured a collection of patriotic music entitled “Celebrate America: Independence Day Observation” and was conducted by Andrew Trachsel. The weather was great; cloudy skies, cool and a little breeze. There was a very nice sized crowd that turned out for the concert. AT one point during the performance the orchestra played a medley of the songs of the armed forces. Members of the audience were asked to stand if they or someone in their family served in the various branches of the armed forces during the playing of the respective song. I was impressed with the large numbers of people that stood as each song was played. A chill ran down my spine as I realized the number of people who have served this country in the military and their families. This was a great way to kick off our Independence Day weekend.